PENTHOUSE FOR SALE in Cabarete by Habi Dominicana Services. Luxury, space and privacy, in this 2099 s.f. 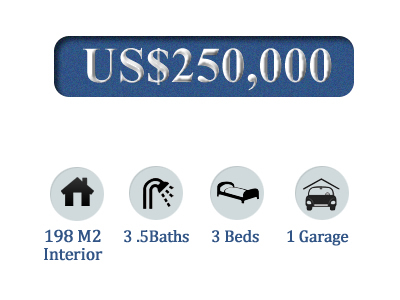 condominium that is for sale in the seaside town of Cabarete, Dominican Republic. This Paradise penthouse offers, 3 large bedrooms, 3.5 bathrooms, open concept living and dining areas. First Floor: Living room with terrace that gives you a view of the magnificent mountains and the sweeping countryside of the North Coast. The kitchen has an island, cabinets made of mahogany, imported tiles and granite counter tops, all appliances are American made. Two bedrooms are on the first floor, each with a full size bathroom, plus a half bath for guests. Second Floor: From the spiral staircase you will enter the master bedroom with air-conditioning, spacious layout, and a walk-in closet, lined in cedar. There is a large open terrace to enjoy intimate evenings and more spectacular views of the mountains and luscious landscaping. There is also a storage room for your convenience. European aluminum glass doors & windows throughout the condo. Relax by the pool and enjoy 24 hour electricity and security services. The township of Cabarete offers tourists, locals and homeowners all the amenities but, in a small town setting. Shops align the main street and the beach front, offering many services, restaurants, night clubs, shopping and tour packages. Cabarete is world famous for kite surfing among many other water activities that await you. Only 15 minutes from the International airport, 10 minutes to the very popular town of Sosua, and the city of Puerta Plata. Transportation is easily accessible and offers, car rentals, taxi’s, motor bikes and local vans for your traveling needs.